"Jan Fabre: Knight of Despair / Warrior of Beauty" exhibition at the State Hermitage Museum. An exhibition of works by a Belgian artist has led to online hashtag wars and calls for the director of the Hermitage to resign. 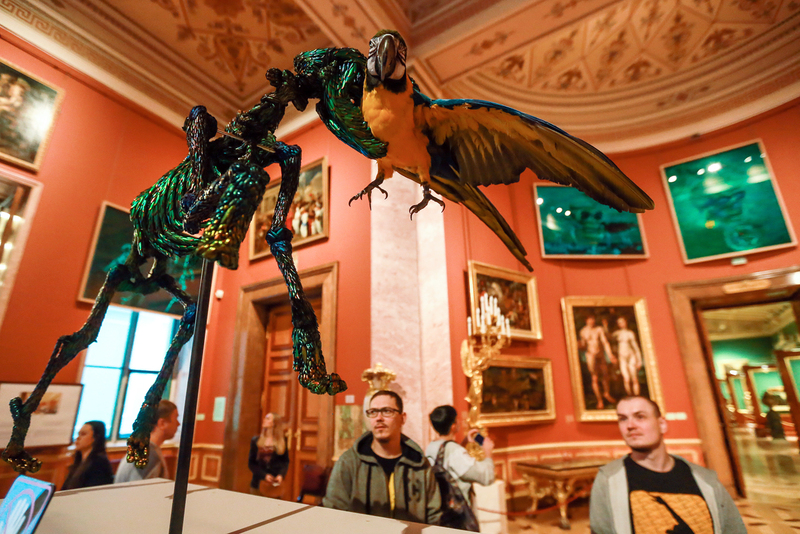 An exhibition featuring installations by the Belgian artist and theater director Jan Fabre at the Hermitage museum in St. Petersburg has provoked an outcry from both human rights activists and art lovers. The exhibition, entitled "Jan Fabre: Knight of Despair, Warrior of Beauty,” feature effigies of dead animals in installations with names such as Carnival of Dead Mongrels and Protest of Dead Homeless Cats. Many visitors have had little positive to say about the exhibition, calling Fabre a “tramp” and a “pelt-skinner” and the works “an abomination.” Internet users have called for the exhibition to be closed and the museum’s director fired, posting messages with the hashtag #pozorermitazhu (“shame on the Hermitage”). Curator Dmitry Ozerkov said that the museum stands by its decision to display the works and that the exhibition will not be removed. Fabre himself is a world-renowned artist whose installations have appeared in dozens of museums, including the Louvre in Paris, as well as at the Venice Biennale and “documenta,” an exhibit of modern and contemporary art that takes place every five years in Kassel, Germany. “To say that I was shocked is to say nothing really. We have hit rock bottom friends! How can such a world-class museum allow this exhibition to take place? !” wrote museumgoer Dasha Samyklina on her social media page after visiting the exhibit. Sova’s comments referred to an exhibition by Jock Sturgess at the Brothers Lumiere Photography Centre in Moscow of photographs taken in a nudist colony. Photos that depicted minors were brought to Moscow but not displayed, although later people found copies of the images online and reposted them. Hermitage supporters also took to the Internet to remind readers that many museums in Russia have been displaying stuffed animal carcasses and even preserved human fetuses for years. “What would happen if these people went to the Zoological museum or the Kunstkamera?” wrote Elias Panov, referring to the museum in St. Petersburg that has displayed a number of preserved “natural oddities” since the time of Peter the Great. Hermitage supporters are using the hashtag ‘#koshkizafabra’ (“#catsforfabre”), referencing the famous Hermitage cats. The Russian Ministry for Culture has declined to take sides in the debate, releasing a statement saying only that the Hermitage has great independence and freedom, and should therefore “determine its own priorities when creating exhibits” and making artistic decisions.